Henna for Hair~ Find a Stylist to henna your hair: no chemicals ` just natural plants and beauty! There is an epidemic of sensitization to para-phenylenediamine. This chemical, or a closely related chemical, is in nearly every oxidative hair dye. According to my PhD research, by 2030, one out of every six people will be allergic to oxidative hair dye. Nearly half of them will have severe allergic reactions which will require hospitalization. These people can be safely transitioned to Ancient Sunrise® hair dyes. We can bring a four day comprehensive training program to your salon! Call us toll-free at 1-855-MEHANDI! We'll help you learn to use chemical-free hair dye. This is four day course of live instruction and demonstration in the art, history, and science of henna for hair. The price per student is variable based on the number of students enrolled in the program. A stylist or salon may also purchase extended online support following this program. 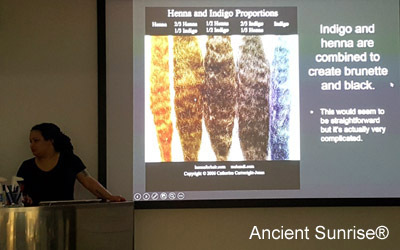 Catherine Cartwright-Jones PhD, owner and research director of Ancient Sunrise® has organized 19 presentations as a comprehensive education in henna for stylists, salon and spa owners, and developers. By 2030, 16% of graying adults will be sensitized to the chemicals in oxidative hair dye, and 7% of those will have a life-threatening sensitization. These clients can be retained by offering henna as an alternative. 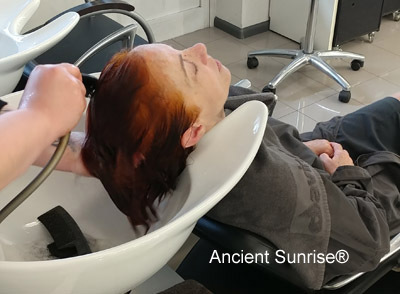 The Ancient Sunrise® training program is oriented towards stylists who are becoming sensitized to chemicals and who do not want to give up their chosen profession. This program shows stylists how to recognize early symptoms of sensitization in themselves and in their customers so they can transition to henna before the sensitization becomes life threatening. This series of lectures and demonstrations teaches stylists to transition customers to henna who have been advised by their doctors to stop using oxidative hair dye. 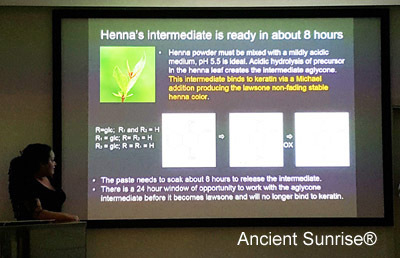 The Ancient Sunrise® henna for hair salon and spa training program shows salon owners how to slightly modify their practice so that they can retain valued customers and stylists who are becoming sensitized to oxidative chemicals or who have been advised by their doctors to stop using oxidative hair dye, thus improving client retention. 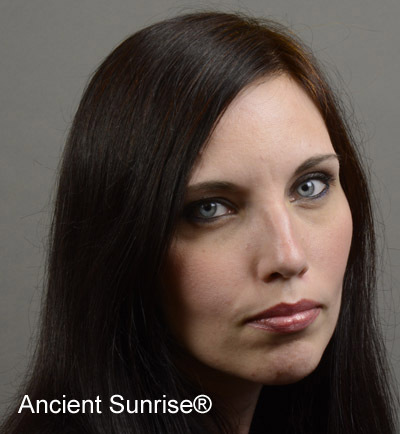 Why should you take the Ancient Sunrise® training course? There is an epidemic of sensitization to para-phenylenediamine and related oxidattive hair dyes. The $25 billion oxidative hair dye industry will lose $4 billion annually to sensitization by 2030. This loss of customer base can be recovered by developing pure plant hair dyes. This person is severely allergic to oxidative hair dye. If she uses regular chemical hair dye, her scalp will break out in blisters. 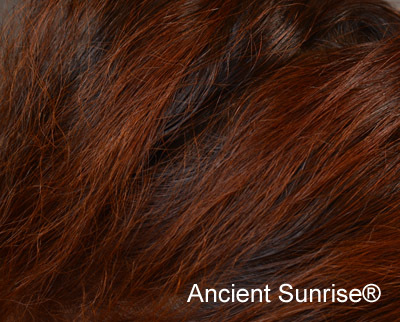 Now she safely covers her gray hair with Ancient Sunrise®. Click HERE to view an introduction to the lecture series, for free. This Ancient Sunrise® Henna for Hair stylist training program consists of a live four day set lectures and demonstrations by our instructor and lecturer. We will train up to ten stylists in the use of henna in your salon or spa. The stylist program focuses on training stylists in the art and science of henna application. A live presentation of 18 slideshows with material for transitioning people away from oxidative dyes. Answers to 10 follow-up questions submitted by email answered by CCJ and Maria Moore. 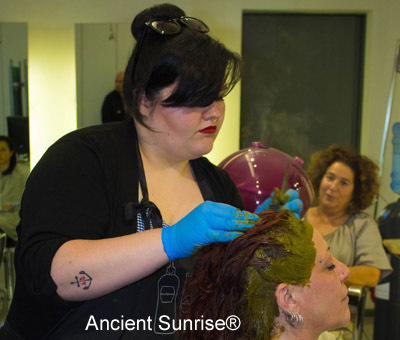 This Ancient Sunrise® Henna for Hair stylist and salon manager training program consists of a live four day set lectures and demonstrations by our instructor and lecturer. We will train up to twelve stylists and managers in the use of henna in your salon or spa. The salon and spa program focuses on not only training stylists in the art and science of henna application, but shows managers how to profitably integrate henna into their salon and spa services. The business or person contracting The Ancient Sunrise® Henna for Hair Stylist Program will pay a tuition fee to Tapdancing Lizard LLC. In addition, the business or person contracting the instruction will pay for transportation, room and board for two instructors and one assistant. The more attendees whom the business or stylist can bring together for this lecture and demonstration series, the lower cost will be per student.